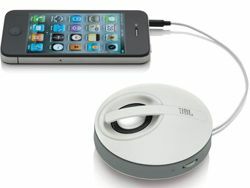 JBL launches £35 On Tour Micro portable speaker | What Hi-Fi? JBL has launched the On Tour Micro, a £35 portable speaker. The On Tour Micro has a rechargeable battery that powers via USB for up to six hours of playback. An integrated stereo minijack cable will connect to any standard headphone output on any MP3 player or smartphone, so iPhone and Android alike are supported. What's more, you can daisy-chain any number of the speakers together should you want to increase the amount of sound. The JBL On Tour Micro is out now for £35.